Experience your dreamy Roman holidays. An oasis of absolute silence in the heart of Rome, a few dozen meters from Piazza Venezia and the Vittoriano! From this incredible location you can visit the Eternal City simply on foot (or by bus, because the stops are very close), you will enjoy all the beauties and comforts of living in the centre, yet nothing and nobody will disturb your peace and your rest. Located on the first floor (reachable by elevator or stairs) of an ancient historical building of the fifteenth century (which in the past has also hosted a convent), the apartment is on two levels. On the first floor, living room and kitchen with dining room and fireplace; on the second, on a mezzanine, bedroom, bathroom and shower. Huge windows make the room very bright. In the living room area, a comfortable three-seater sofa and a ruby red velvet armchair are an invitation to moments of authentic cocooning, relaxed, wrapped in a soft blanket, reading or watching a good movie on the flat-screen TV. What could be better, after having toured the city, alive with colours and sounds, than savouring these moments of beatitude? The cinema, as some details suggest, is an important element here. Because we are in Rome, obviously, and also because in this area, between Fori Imperiali (Imperial Fora) and the Colosseum and via del Corso, thousands of television and film productions have been filmed, but it is also the owner’s profession. In short, here the cinema is at home. The fully equipped kitchen with dining room for four is perfect whenever you want to eat in the apartment, in the bright daylight or in romantic evenings. A modern internal staircase leads to the upper level. There, you will find a comfortable double bed, chest of drawers and closets to store clothes, a vanity table and a spectacular open shower. On the ground floor of the building, there is a charming internal garden, with green grass and plants and trees: a delightful place that will give you pleasant moments. On the top floor, there is a large shared terrace with a breathtaking view over the rooftops of Rome and its monuments. It feels like you can touch the Altare della Patria (Altar of the Fatherland) and the Campidoglio, they are actually very close and your look can reach the magical Giardino degli Aranci (the Orange Garden). The sky of Rome seems wider and more enveloping, from here. The light seems warmer and more golden: the artists’ light, the one that you dream of when you dream of Rome. Like in a movie, in which no external noise interferes with the lines and the chosen soundtrack. Our guests will be the directors of their own personal Roman history and we, with our assistance, will assure you only positive emotions and, of course, the happy ending. Lovely flat and perfect location to explore Rome by foot! Super quiet and beautiful flat in the middle of all the amazing things to see in Rome. Walking distance to all my favorite spots in the eternal city! 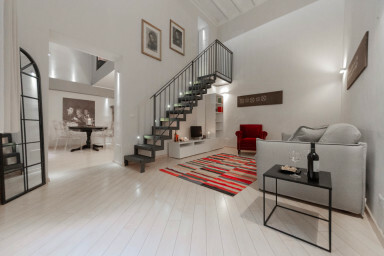 Beautiful apartment, right in the centre of Rome and in a wonderful neighbourhood. Thank you very much!